This is the tale of Doodeedoo, who was made of socks and superglue by a little mouse with tiny paws, red painted lips, and well-trimmed claws. She'd read a book called Frankenstein but never passed page 109, and as she said, "I'll have a go!" The mouse picked up some thread to sew... And so the tale goes. A fun story for children, written in rhyme, and a lesson in not judging a book by its cover... so to speak. 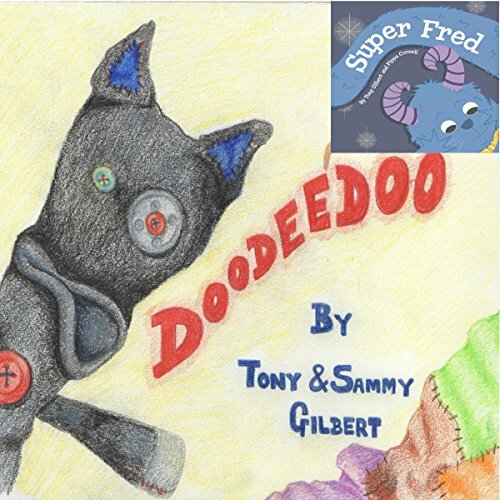 Would you consider the audio edition of Doodeedoo to be better than the print version? I really think the narrator brings extra life to the story. It's wonderfully narrated. Fred. He was a quirky character. What about Chris Barnes’s performance did you like? The different voices, the pacing of the narration and the great intonation. His Scottish accent is so nice to listen to and he reads beautifully. It's a rather short children's book, so this question is not too relevant. I was given a free copy in exchange for a review. I don't read a lot of children's books, but this one was very creative and sweet. I think it's a lovely read for primary school children. Would you listen to Doodeedoo again? Why? I listened to Doodeedoo, and the other two stories, with my youngest. He was captivated by the stories, especially Doodeedoo, and really enjoyed it. He asked to listen to it several times, especially when laying down to relax. What was one of the most memorable moments of Doodeedoo? The ending of the story Doodeedoo was the most memorable. It teaches children, and adults, that acceptance of someone is okay even if they are different than us. It teaches us that sometimes when a person seems angry, it's not that they are angry at us, it's that sometimes there is something more going on. Being a friend and being nice can help someone else overcome some fears and struggle. We can only give them a chance. The mouse in Doodeedoo. She was a tiny little thing but as brave as a lion. She overcame her fears by finishing a scary book, and by learning to befriend someone who seemed scary. What made the experience of listening to Doodeedoo the most enjoyable? Great writing and rymeing and grwat narration. Doodeedoo love the way he was made. He sets the scenes realky well and adds voice to the charachters. This is great for familys to sit down and listernrn to together. Or for the childrens bedtime story. If you could sum up Doodeedoo in three words, what would they be? I loved the creativity of the stories - full of imagination, character and atmosphere, which was added to by Chris Barnes' varied and fun performances. Fred was lovely. "Oh what am I to do?" It was both charming and funny, had a morose, wobbly sound to it and made my 5 year old smile. Chris Barnes does vary his narration in accent and tone from story to story, which gives variety, and he captures the magic and rhythm of the stories, bringing out the childish wonder beautifully. All of the stories were very atmospheric, and while they are all told in rhyming couplets, there are some tender moments. I was quite touched by the boy's initial attempts to reach out to the monster Fred, who shied away from him. It was sensitively read, and the image of a self-protective monster was quite a touching one. I loved DooDeeDoo and Super Fred. Real classics, with memorable characters that I know we'll want to relisten to. The House Inside the Forest was also beautifully written and beautifully read - but I felt it had a darker, spookier edge than the other two, so felt slightly more suitable for older children than my (just) 5 year old. Saying that, she still enjoyed it, and it's the tiniest of quibbles. I just felt that the other two matched each other more in tone. This story is a wonderful children's tale. It is beautifully told and read. The incredible writing and rhyming gives it great flow, and it's fantastic for youngsters.